Canadian astronaut Chris Hadfield snapped this photo of Earth from space from the International Space Station during the Expedition 34 mission. The January 2013 photo shows Newfoundland and Labrador from orbit. 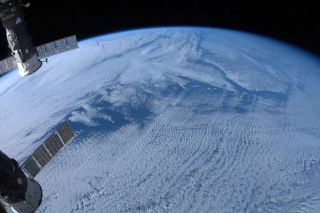 From high above Earth, Canadian astronaut Chris Hadfield is broadcasting a message of peace for the people of Earth, with a little help from 200,000 Twitter fans. The three-time spaceflyer, a flight engineer and prolific Twitter user on the International Space Station, spoke solemnly Thursday (Jan. 10) about a picture he recently took of war-torn Syria. The picture had special poignancy given that the Earth appears as "one place" from orbit, Hadfield told reporters in a press conference at the Canadian Space Agency's headquarters near Montreal, Quebec. Canadian astronaut Chris Hadfield poses with his computer in the International Space Station on Jan. 11, 2013, He uses the computer to post updates and photos of his Expedition 34/35 mission on Twitter. "When we do look down on a place that is in great turmoil or strife, it's hard to reconcile the inherent patience and beauty of the world with the terrible things that we can do to each other as people, and can do to the Earth itself, locally," Hadfield said from space. Hadfield, 53, spent his first three weeks in orbit sending dozens of pictures of his view on Earth. That, plus a Twitter chat with Star Trek actor William Shatner and other celebrities, propelled his social media account @Cmdr_Hadfield on to the world stageafter his launch Dec. 19. This weekend, Hadfield's Twitter feed surpassed 200,000 followers. As of Sunday (Jan. 13), the count was at 204,630 fans. "That’s probably the reason we work so hard to communicate what we’re doing up here, as an international team ... to just try to give people just a little glimpse of that global perspective, of that understanding that we’re all in this together, and that this is a spaceship, but so is the world." Canadian astronaut Chris Hadfield poses with a camera in the Cupola of the International Space Station, which serves as the observation deck, during the Expedition 34 mission in January 2013. "With these new technologies in communications, we can directly give people the human side of that. The fact that now, gosh, more than 150,000 people are directly following us every day – I think it’s just a direct measure of how important and useful this is in the human experience." Hadfield is a veteran shuttle astronaut who previously flew to Russia's Mir Space Station in 1995 and performed the first Canadian spacewalk on station in 2001. He said that an important part of his personal experience is sharing what it means to be Canadian with his Russian and U.S. crewmates. "I, here, represent Canada. So I talk about how I grew up, and what values are important in Canada," said Hadfield, who was raised in small-town Ontario and flew military CF-18s for the North American Aerospace Defense Command (NORAD) before joining the astronaut program in 1992. "Between Canada and Russia and the U.S., we cover a lot of the world’s dirt. A lot of the world’s territory. So there’s lots of opportunity, while you’re looking out the window together, to share the experience," Hadfield said. With more than three weeks in space on this mission, Hadfield has now surpassed the 20 days of experience he accumulated in two decades as a Canadian Space Agency astronaut. Living on station for long periods of time allows people not to rush, and to savour the experience a bit more than during jam-packed shuttle missions, he said. "[I am] able to have a measured, thoughtful existence to absorb what it is like," he said. Hadfield also took time to relax in between questions. He playfully spun a roll of duct tape in front of the camera. At times, he squatted on a wall of the U.S. Destiny laboratory where he was slated to do fluid experiments directly after the press conference. In his limited spare time, Hadfield pledged he will continue to record guitar songs in space such as "Jewel in the Night", which was written by his brother, Dave. By the time his five-month mission is over, Hadfield quipped, he may have enough material to release an album.